Jesse "Doc" Wendel: "Home Sales vs. 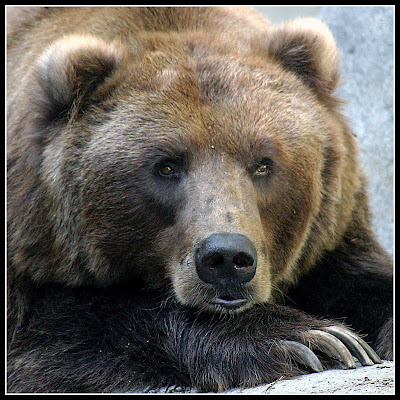 Recession"
Thanks to Doc Wendel for this great post! This is the best single article I've read on what I believe is a coming full-blown major depression in the United States of a size not seen since The Great Depression. "Home sales were falling prior to every recession, with the exception of the business investment led recession of 2001. This should raise concerns about a possible consumer led recession in the months ahead." Click on graphs for larger image. 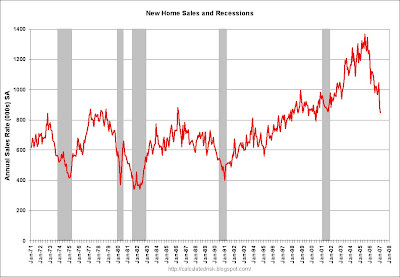 The first graph shows New Home Sales vs. Recession for the last 35 years. New Home sales were falling prior to every recession, with the exception of the business investment led recession of 2001. This should raise concerns about a possible consumer led recession in the months ahead. 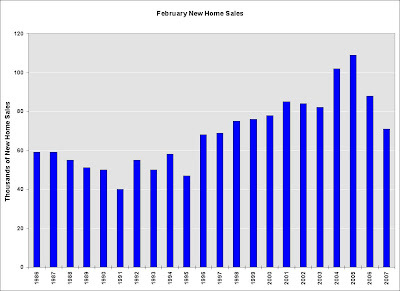 The second graph shows Not Seasonally Adjusted (NSA) New Home Sales for February. Sales have fallen back close to the levels of '96 and '97.